All pet parents want the best for their dogs. Stewart Fiber Lamb & Rice Formula Dog Biscuits were developed by a veterinarian for dogs in response to the pup’s that required a special diet. For decades, our quality standards, combined with premium ingredients, ensure that you’re feeding safe dog treats in support of your best friend’s therapeutic diet. 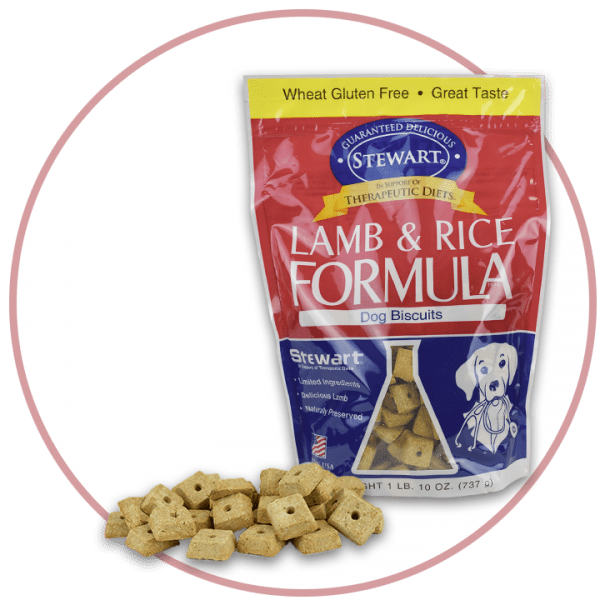 Stewart Lamb & Rice Formula Dog Biscuits are a crunchy treat that’s perfect for pets with no tolerance to beef, chicken or wheat. Lamb & Rice Formula Dog Biscuits were specifically developed for dogs with special needs and restricted diets. Healthy dogs love them too! They are a smart choice to maintain the health of your beloved pet. Plus they are only 10 Kcals per treat making them an acceptable treat for dogs on a restricted diet when used in moderation. Your veterinarian can recommend feeding guidelines based on your dog’s overall health, fitness and dietary needs. Barley, Rice, Lamb Meat, Potato, Soy Oil (preserved with mixed tocopherols).